Can the government use civil forfeiture to take your money when you have done nothing wrong—and then pocket the proceeds? The IRS thinks so. For over 30 years, Terry Dehko has successfully run a grocery store in Fraser, Mich., with his daughter Sandy. In January 2013, without warning, the federal government used civil forfeiture to seize all of the money from the Dehkos’ store bank account (more than $35,000) even though they’ve done absolutely nothing wrong. Their American Dream is now a nightmare. Federal agents in Michigan struck again in March and April of 2013, when they seized the bank account of Mark Zaniewski’s independently owned gas station (more than $70,000). Neither the Dehkos nor Zaniewski were charged with any crime—the Government merely believed without any real investigation that the deposits of the lawfully earned money from their legitimate businesses were suspicious. But federal civil forfeiture law features an appalling lack of due process: It empowers the government to seize private property from Americans without ever charging, let alone convicting, them of a crime. Perversely, the government then pockets the proceeds while providing no prompt way to get a court to review the seizure. The Dehkos and Mark Zaniewski teamed up with the Institute for Justice to fight back in federal court in 2013 and, after nearly a year of expensive litigation, the Government returned their money. The Dehkos and Zaniewski are continuing the fight, however, to ensure that the Government respects due process whenever it seizes money in the future. A victory will vindicate not just their right to be free from abusive forfeiture tactics, but the right of every American not to have their property wrongfully seized by government. Terry Dehko and his daughter Sandy Thomas run Schott’s Supermarket, in Fraser, Michigan, a suburb north of Detroit. Terry has owned and operated the market since he bought it in 1978. The store employs about 30 people and is popular for its quality deli selection and for baking fresh bread each day. Sandy has worked at the market since she was 12 years old. On January 22, 2013, Terry and Sandy woke up to find that all of the money in the store’s bank account had been cleaned out—more than $35,000—without warning or explanation. Later, they learned that the federal government had seized the account using a process known as civil forfeiture. Civil forfeiture is the governmental power to take property suspected of being involved in crime. Unlike criminal forfeiture, in which the ill-gotten gains of criminal activity may be seized after an individual is convicted of a crime, prosecutors can use civil forfeiture to take property without having to convict or even charge a person with any crime. The property taken by the government is then used to pad the budgets of the very agencies that seize it. In this case, the government claimed that Terry and Sandy violated federal banking laws by making frequent deposits of their store’s cash receipts in amounts less than $10,000. Banks are required to report larger deposits to the IRS. But it’s not illegal merely to deposit lesser amounts when one has a legitimate business purpose for doing so like Terry and Sandy did. Had the government simply bothered to ask, it would have learned that they were not trying to avoid those banking regulations. But it didn’t ask and, eight months later, the family is still waiting for hearing before a judge, which the Constitution requires in order to protect innocent people from wrongful takings like this one. Unfortunately, when federal agencies seize cash, federal civil forfeiture laws, as currently written, provide no prompt way to get a court to review the seizure. The perverse incentives and lack of due process at the heart of civil forfeiture put innocent people like Terry and Sandy at risk. That is why the Dehko family has joined with the Institute for Justice to get back what is rightfully theirs and challenge the government’s use of civil forfeiture to take money from people who have done nothing wrong. They will ask the U.S. District Court for the Eastern District of Michigan to declare that law-abiding companies like theirs are permitted to make frequent cash deposits for legitimate business purposes—and that the Constitution requires that every person whose property is taken from them through civil forfeiture receive a prompt hearing to contest that seizure before a neutral tribunal. Prosecutors can use civil forfeiture to take property without having to convict or even charge a person with any crime. Tarik Dehko, who goes by “Terry,” came to America for a better life from Iraq in 1970. He started a family near Detroit, and, in 1978, he bought Schott’s Supermarket, which has put food on his family’s table for more than thirty years. Terry’s daughter Sandy started helping around the store at age 12 and now has four children of her own. At age 70, Terry still works six days a week and can hardly imagine what else he would do with his time. He is proud of his store—the fulfillment of his American Dream. Over the past few decades, the store has had two different locations, has been remodeled, and has expanded its services. The store’s prosperity has rippled across the community, and it serves that community by providing delicious food, great service and jobs for more than 30 people during difficult economic times. The store is especially well known for its deli and meat department, which makes dozens of varieties of custom sausages. Like most grocery stores, Schott’s Supermarket takes in a significant amount of cash each day from customers. Terry’s policy has always been to send one of his store’s clerks to the bank—located just across the street—to avoid letting too much cash accumulate at the store. This is just common sense. Keeping a lot of cash on the premises poses unnecessary risks and serves no business purpose. Moreover, the store’s insurance policy specifically limits coverage for theft or other loss of cash to $10,000—a common provision for small business policies. Despite the difficult economic times, Schott’s Supermarket manages to turn a modest profit and keep people employed. But it doesn’t have money to spare. So Terry’s American Dream turned into a nightmare when the government grabbed $35,000 from his store’s bank account without warning—that $35,000 represented operating funds he needed to pay vendors and employees. Though Terry and Sandy have managed to negotiate with creditors and keep their business afloat using their personal savings, they are shocked by the government’s reckless use of civil forfeiture. Terry and Sandy are hard-working Americans whose business supports their families and their community. They have never been charged with any crime in their lives. Every penny they have has been lawfully earned. But instead of congratulating Terry and Sandy for creating jobs and running a successful business, the federal government is treating them like criminals. Adding to the Dehkos’ dismay over the government’s ham-fisted seizure of their store’s bank account is the fact that the government reviewed the store’s financial records and practices —not once, but twice—and gave them a clean bill of health. But in January 2013, the IRS obtained a secret warrant and cleaned out the store’s bank account on the grounds that the Dehkos’ frequent cash deposits—deposits of which the IRS was well aware when it issued its clean bill of health just nine months before—violated federal “structuring” law. Civil forfeiture represents one of the most devastating assaults on private property rights today. In America, the government shouldn’t be allowed to roll up and take your money, like some playground bully. But that’s exactly what the IRS and the Department of Justice did to Terry and Sandy. It is a travesty. As noted above, federal law requires banks to report cash transactions in excess of $10,000 to the IRS. It is illegal to “structure” one’s deposits or withdrawals in an effort to avoid those reporting requirements. But it is not illegal merely to deposit money in lesser amounts when one has a genuine business purpose for doing so. The law makes perfectly clear that it is a violation to structure transactions only when done for the specific purpose of trying to evade bank reporting requirements. That’s what the government told Terry in 2010, when the IRS visited, and that’s why he never imagined he was doing anything wrong. Terry and Sandy continued making cash deposits to avoid storing too much cash on the premises and to ensure that any losses they might suffer would be covered by their insurance policy. Yet without so much as a phone call to investigate the matter, the government grabbed their money. And federal civil forfeiture law, as currently written, does not allow a property owner to get a prompt hearing before a court to contest the seizure. This violates a bedrock principle of due process, which provides that a person who has her property taken by the government is entitled to notice and an opportunity to be heard—promptly—by a judge. By contrast, if a creditor had sent the local sheriff to repossess an oven or refrigerator from Schott’s Supermarket, the safeguards in place to prevent an unjustified taking would have been far more stringent than when the federal government seized their entire bank account. This is just one reason why civil forfeiture represents one of the most devastating assaults on private property rights today. Civil forfeiture law provides financial incentives to law enforcement to seek and seize cash. It allows the government to take property just by alleging that the money is suspected of being involved in a crime. And it requires that owners of the property engage in a lengthy and expensive federal court battle to prove their own innocence in order to get their money back. These three factors work in combination to make injustices like the one being perpetrated against Terry and Sandy inevitable. To make matters worse, forfeiture law treats property owners like random bystanders and requires them to intervene in the lawsuit filed by the government against their property just to get it back. That is why civil forfeiture cases have such unusual names, such as United States v. $35,651.11 in U.S. Currency—the case involving Terry and Sandy. And worse still, federal law was changed in 1984 so that forfeited property is actually used to pad the budgets of the agencies that seize it. This creates a perverse financial incentive for government agencies to spend their time taking money from people who have cash, instead of protecting us from actual criminals. Forfeiture was supposed to take money that represented the “ill-gotten” gains of criminal activity. But when it is used to take money law-abiding entrepreneurs like Terry and Sandy who have done absolutely nothing wrong, the line between law enforcement and legalized theft becomes indistinguishable. That cash-hungry government agencies would begin taking money from law-abiding businesses that make frequent cash transactions was a perfectly foreseeable result when the Patriot Act amended federal law to make it easier for the government to use civil forfeiture in “structuring” cases like this one. A victory for Terry and Sandy in this case will vindicate not just their right to be free from abusive forfeiture tactics, but the right of every American not to have their property taken from them by irresponsible bureaucrats when they have done nothing wrong. Terry and Sandy are prepared to go all the way the Supreme Court if that’s what it takes to stop the government from using civil forfeiture to take money from innocent people and businesses. There are two separate lawsuits involved in the Dehkos’ case. First, the government has filed a civil forfeiture action seeking to validate its seizure of the Dehkos’ bank account. In that case, the Dehkos appear as “Claimants,” asserting their right to have their money returned because they did not violate any laws and because the government missed its deadline for filing the court action after seizing their money back in January. As part of their defense, they will show that they make frequent cash deposits not to evade any reports that their bank must make to the IRS, but for a simple, ordinary business purpose: it is a bad idea to keep a lot of cash on the premises of a small grocery store, particularly when their insurance policy only covers thefts or other losses of cash up to $10,000. The civil forfeiture action is being heard in the United States District Court for the District of Eastern Michigan by the Honorable Terrence G. Berg in Flint, Michigan. Besides defending themselves in the civil forfeiture action, Terry and Sandy have filed a new lawsuit challenging the government’s use of civil forfeiture in this case. In that lawsuit, Terry and Sandy will seek a court ruling that: (1) they—and all other property owners—are entitled to a prompt hearing either before or immediately after the government takes their property and (2) it is not illegal for law-abiding businesses like Schott’s Supermarket to make frequent cash deposits for legitimate business purposes. Terry and Sandy have asked that the two lawsuits—the one in which they are seeking the return of their property and the one in which they are challenging the legality of the government’s conduct—be consolidated and heard as one matter before the same judge. In the Dehkos’ lawsuit against the government seeking a ruling that they did nothing wrong and are entitled to a prompt hearing before a neutral magistrate, Terry, Sandy, and their company are the plaintiffs, and the defendants are representatives of the IRS and the Justice Department, as well as the U.S. Attorney for the Eastern District of Michigan, Barbara L. McQuade. The Institute for Justice is the national law firm for liberty, and the nation’s leading legal advocate for property rights and economic liberty. The Institute has come to the defense of property owners nationwide to fight unjust civil forfeiture actions, including the owners of the Motel Caswell in Massachusetts; the owner of a small commercial building in Anaheim, California; and the owner of a truck seized in Houston, Texas. 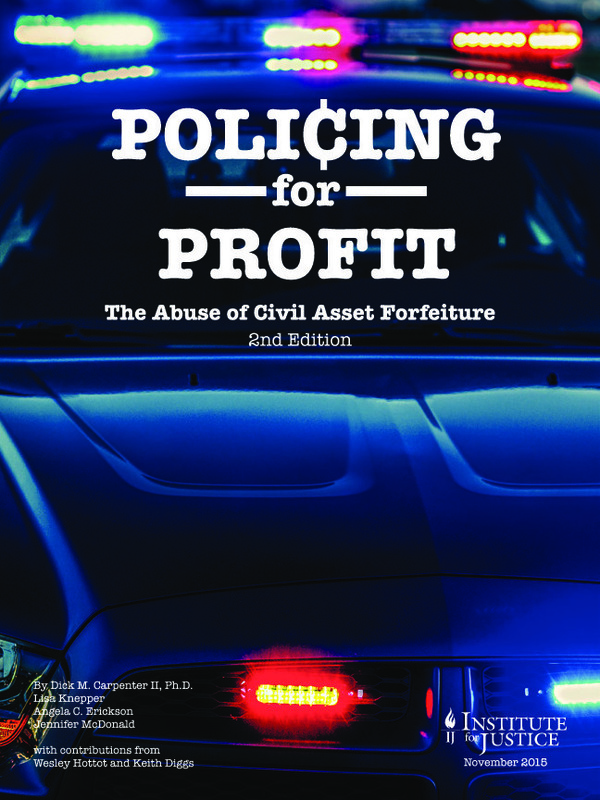 In 2010, the Institute published the landmark report on civil forfeiture, Policing for Profit. The litigation team consists of Institute for Justice Senior Attorney Clark Neily and Attorney Larry Salzman. They will be assisted by local counsel Stephen Dunn of Dunn Counsel, PLC, from Troy, Michigan.